Happy New Year all!! I just made this funny dog card because 2018 is a year of a dog. Enjoy my card and Happy New Year!!! 모두 새해 복 많이 받으세요!!!!!! My mum’s new space, Youtube. My mum is now a big fan of Youtube. She used to be one of Korean drama fans like other ajummas in Korea or even in the world. One day in last year, she asked me how to ‘watch’ the video that one of her friends sent to my mum via Kakao Talk. I taught her how to ‘touch’ that link and ‘watch’ those videos on Youtube on her smartphone. She brought earphones and grab her smartphone to watch that video on Youtube. That was her first experience of watching TV on her mobile not on TV in our living room. After that day, she seems to enjoying new ways of watching TV on Youtube. Whenever she came back home she put earphones on her ears and started watching videos sent from her friends. The genres of videos are tremendous. From her friends’ grandchildren’s videos to some serious political issues as well. In my opinion, her favourite genre is pretty much about political issues and some traveling video logs. So now, she rarely watch the TV in our living room even though there are Korean dramas every night on TV. She said that she and her fiends enjoy watching Youtube on their smartphones because they can ‘choose’ the channel what they want to ‘watch’ without barriers of time and space. Also she mentioned about her own space while she’s watching her chosen Youtube channel on her smartphone. (I found that is very interesting because I also feel like I’m in my own space whenever I watch my subscribed Youtube channel by myself) Indeed, watching those Youtube videos are sorta big trend among my mum’s fiends (and her age group, ajummas). They now share good, useful or hot issued videos through Kakao Talk’s group chat room and they’re talking about those videos when they meet at offline spaces. (from online to offline and come back to online again, it is a looping communication process I already mentioned in my thesis). Furthermore, my mum has her favourite Youtube BJ (ajumma BJ) and she said that BJ is very famous among ajummas. (I’m watching Youtube almost everyday but I never heard about that BJ before. So I realised that the world of sns such as Youtube is amazingly big to know every single channels and their BJS because of its characteristic reason. Everyone’s needs are becoming various and wider so the small channels (niche channels) are becoming bigger and deeper I think. For this reason, there are famous ajumma BJs on Youtube but I’ve never heard about them at all. And vice versa. These days, I feel like I’ve reached my limit on this Ajumma research because there’re so much funky and something useful/informational research around me. 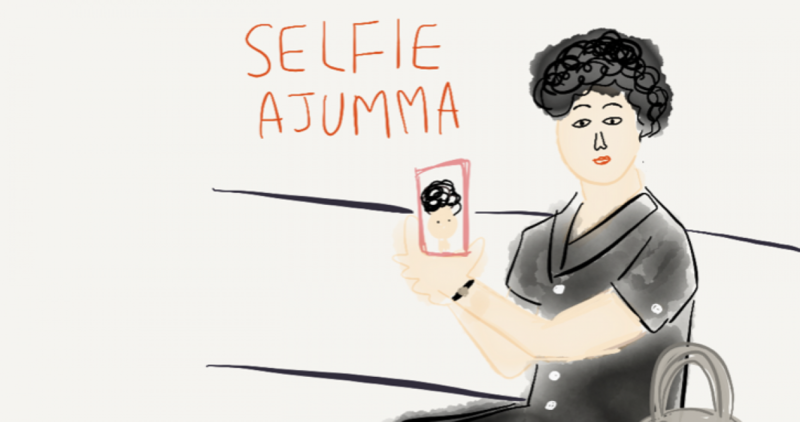 I am kind of losing my confidence to keep doing this research about ajummas. So I didn’t do much working, studying and writing recently. But, I changed my mind and I will do something very exciting research about ajummas. Maybe my research isn’t that necessary to change this world or to impress others on the conferences, etc. I truly don’t care about others. I love my research and I will keep doing my research and writing even though my English writing isn’t that good enough compared with other ‘native’ writers/speakers. I will keep working hard and at the same time I will enjoy my life as an ajumma expert, like my mum started learning something very new and enjoying those new things. Kore website wrote about Ajumma EXP!!! Today, I went out for having lunch with my mum near my house. One of my mum’s friends sent a Kakao Talk message to my mum and she wanted to join us to have coffee together. So we did. We ordered good coffee and tea cookies. She (my mum’s friend) started talking about her grand children so any other grandmothers do. Her grand daughter became 6 this year so her daughter-in-law is now looking for the pre-school for her daughter. My mum’s friend talked about Yeong-Yu (Yeong eh Yu Chi One which means English speaking kindergarten. In these types of kindergarten, the students are only allowed to speak in English during the classes, so their parents believe that it should be very good opportunity to learn English since early years. So the entrance competition rate for these kindergartens is getting extremely selective even though the tuition fee is high compared with normal public kindergartens. Here is a very useful and interesting online website for ‘moms’. Its name is ‘Gang Nam Um-ma’ (Gang nam mothers). And they uploaded and shared useful information about schools, kindergartens, Hak-Wons (private educational institutions) on the website. I think moms (mothers, and I defined them as younger version of ajummas) also have very unique culture of their own like ajummas, so I will do some research about these moms in Korea very soon. This is amazing! I found ‘Ajumma EXP’ and they’re lovely ajummas doing flash mobs and various performances. The most important thing is that this lovely community has the exact thought about our ‘ajummas’ –middle aged women. I’m still reading their blog and other social media sites so I will upload more about them asap. I’m so happy to know them and I feel like I can do something more exciting thing for our ajummas. (Even though I got rejected email from one of journals this morning but I’m still happy because of this community. ^_^ Go AJUMMAS!!!! Have you ever heard about TDC in Japan? They’re dance club in Japan that are consist of high school girls. Their dance is amazing and I found this YouTube video that I’ve attached below, and their looking (costumes and permed hair) is very similar to typical stereotyped images of ajummas that most media (TV dramas for example) describes. Of course they didn’t imitate ajumma. But I just wanted to share this video of TDC because their dance is amazing and also they’re presenting the unique culture of certain era through their costumes, music and dancing. I really like their performance and I hope our beautiful ajummas will be reflected as the unique group that people can enjoy their uniqueness through various types of interpretation and understanding.